For today's Feathered Friend Friday, I thought I would post something a little different. Normally I write about chickens or guineas, but I recently saw something too cute not to share. This is the second year that a bird has returned to this nest by our garage to lay her eggs. I always enjoy watching the mom tend to the nest as I wait impatiently for the babies to hatch. I was so excited earlier this week when I saw these five tiny birds in the nest! After I snapped the above photo, the mama bird was getting very angry with me, so I left her babies alone for a while. It was hard to do! A couple days later, I noticed the birds standing up in the nest looking like they were ready to fly away. I remembered last year how they jumped out of the nest but stayed close by for a while, so I was wondering when I would see them walking around the porch. Soon after I saw this little guy hanging out on our bench. He was so precious and let me get pretty close to get this shot. I really enjoyed seeing him out there whenever I would walk by. A couple more days later, I saw that one of his siblings had left the nest to join him on the bench. I really wanted to pet and hold them (I swear I'm like a giggly little girl when I see baby animals), but I figured it's probably best not to interfere with nature and decided to just let them be. Today the nest is empty and there is no sign of the birds, so hopefully they found their wings and flew off to bigger and better things. Maybe next year one of them will return to the same nest to hatch her own eggs! PS - Does anyone know what type of bird this is? I am not good at identification so I don't have a clue! oh my goodness, how cute! have a great weekend! Tammy, I'm not sure what kind of bird that is either-but I do know that he-or she, is a cute as can be!! I would have wanted to hold them, too, but you did the right thing by leaving them alone :) They are SO darn cute & cuddly!! so adorable! maybe eastern phoebes? We have a bird who makes her nest in the same little tree outside of our front door every single year, and I love it! Your pictures are great. Oh - that's so fun to be able to watch their progress. They sure are staring you down! These are really fun photos! Aww, they're so cute! I'm no good w/ bird identification either! What great photos! Especially your first one of the baby birds in the nest. What a great thing to have a bird nest near your garage. Thanks for sharing. I'm not good with bird identification either but the photos are just adorable. Baby birds usually don't look much like their parents - but as they are now - maybe a Mocking Bird?? But I feel that you're too far north for a Mocking Bird? Not sure -- but they sure are adorable!! So close and so cute! I just found a nest yesterday, didn't realize it and broke one of the eggs. I felt terrible. They are pretty cute! Love these cute babies, they are adorable! Have a great weekend, Tammy! I LOVE THESE PICTURES! Adorable, beautiful wee birdies! Have to show the girls these :) Thank you for sharing!!! How sweet is that.. I wonderful what kind they are..
Have a great weekend, dear.. This sounds just like my story last year with a robins nest right next to my bedroom window in a cherry tree! The Momma dive bombed me every time I walked out down the walk next to it. Probably didn't help since, I like you, was nosy and taking pictures, ha ha!! Your pictures sure are great and I hope my little nest gets filled again this year. The faces look identical to the birds I took photos of last year and they were Robins! Nice photos of the birdlings, no clue what they are either. Have a great weekend. Have no idea what kind of birds they are, but oh my goodness, are they cute!! I remember the exact moment I fell in like with birds; several years ago I was leaving was walking on a school campus and noticed a tiny bird walking around. It was the first time I was amazed and its tiny stick-like legs that moved that little one around so rapidly. They are precious. They almost look like young starlings. Did you get a good look at the mother? How cute! Great pictures, Tammy! It's wonderful to see them return to the same place , year after year. They are really cute , I can understand why they give you so much pleasure. these little baby birds sure make you smile. i have no idea what they are. they have the widest little beaks - yellow. Tooo cute. Sorry, I'm not very knowledgeable of birds beyond the obvious Cardinal, blue bird, etc. Those are some of the most adorable pictures ever! Love that last shot :) I'm not sure what kind of birds those are, aside from adorable. Those beaks! Too cute. They remind me of starlings or sparrows, but not sure. I am terrible at identification. Great pics! They are so cute! We have mockingbirds who nest in the same bush outside my bedroom window every year. I love listening to them in the morning. Baby birds are so cute! I think we're ready for some more, they build a nest on the ceiling fans out on the deck. You'll probably see yours again for a second hatching or next year. 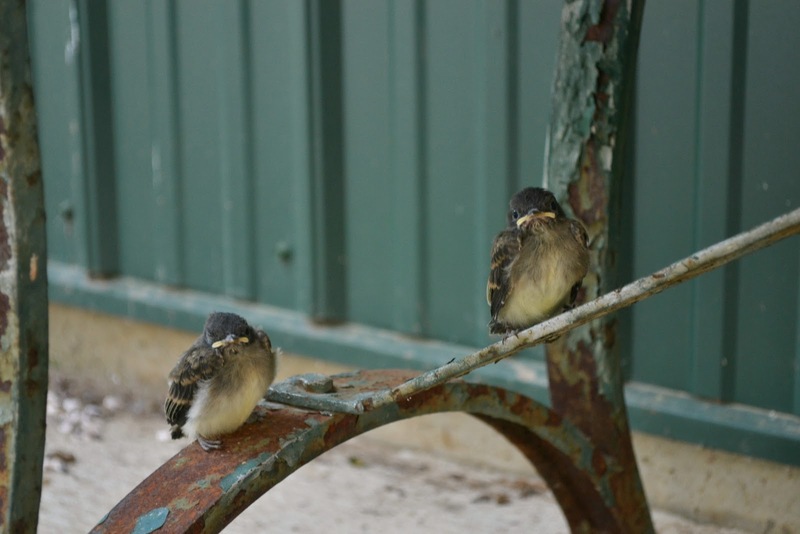 Seriously cute baby birds... I was going to guess barn swallows but it doesn't look like their nest is built from mud. If you can get a photo of the momma bird, you should have no problem identifying them via online bird id sites. Baby birds are so cute. Sometimes, they are difficult to identify when they're young. Quta!! They look like phoebes. And phoebes do return to the same nesting site year after year. Cap as been here for years. I once rescued a bird which I think is an eastern pheobe, but I can't be sure.